From the culture of the Zulu nation to the Portuguese and Arab influences in food and architecture of Mozambique. 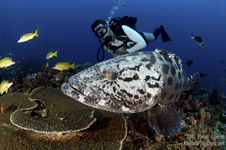 Beaches, excellent diving to big game viewing and bush walks with local ranger. The accommodation, particularly in Mozambique is simple and the roads can be slow. Local facilities are limited so most of the meals are prepared by the Sunway crew. Malaria prophylactics are recommended. 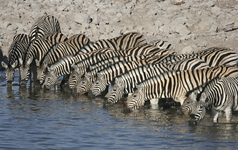 This is an easy paced, relaxing safari for those looking for a different experience in Southern Africa. Departs: Johannesburg, South Africa on Sunday at 6:30am. Ends: Johannesburg, South Africa on Saturday at 6:00pm. • An exciting destination with an exotic flavor! Beautiful and unexplored. • A participation tour that offers an accommodated safari at a reasonable price, staying in chalets, casitas (right on the beach) and cabins. • Fascinating safari with culture, history, wildlife, adventure, diving, fishing, walking and beaches. 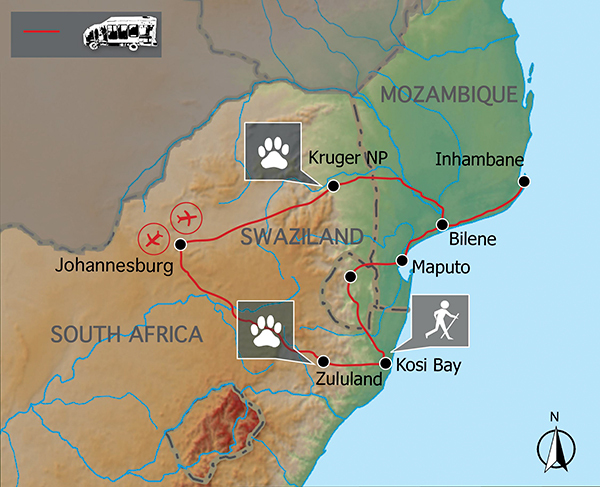 • Zululand wilderness, Swaziland bushveld, Kruger NP, Mozambique beaches and seafood! • The accommodation on this tour is simple in style, with 12 nights twin share en suite chalets and casitas (reed chalets). • 1 night in Bilene has a variety of en suite rooms and two bedrooms sharing a bathroom in a casita, so you may have an en suite room throughout the tour. The guides will sort out room allocations. • 13 breakfasts, 13 lunches and 10 dinners will be provided by the safari guides, prepared either at the truck or in the self catering kitchen. • Meals will be eaten either under the trees near your chalet or around the campfire at the truck. SAFARI COST: $1,975 per person sharing. If you are a single traveler, you will be assigned to room with another same gender single traveler and there is no supplemental payment required. If you request to room alone, then a price supplement will be charged. Departing from Johannesburg at 06:30am we travel through the rolling plains of the Highveld before descending the escarpment into the heart of KwaZulu Natal where we will stay in the Mkuzi Game Reserve. The reserve was established in 1912 and has a large diversity of natural habitats. This diversity of habitat means plentiful game and abundant birdlife. 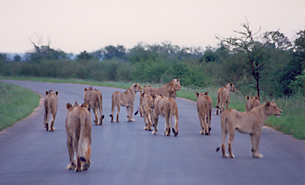 Mkuzi Game Reserve is part of the Greater iSimangaliso Wetland Park, a world heritage site. We explore the reserve on game drives and visit a hide overlooking one of the waterholes to watch the game come down to drink. Mkuzi Game Reserve plays a key role in the preservation of the endangered black and white rhino, and we hope to see these amazing creatures on our game drives. 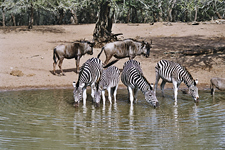 Includes: Entrance fees to Mkuzi Game Reserve, morning & afternoon game drives. Day 1: Breakfast is not included. Day 1: Lunch provided by the tour leaders with the help of the group. Day 1: Dinner provided by the tour leaders with the help of the group. Day 2: Breakfast provided by the tour leaders with the help of the group. Day 2: Lunch provided by the tour leaders with the help of the group. Day 2: Dinner provided by the tour leaders with the help of the group. Overnight: Mkhuzi Game Reserve, permanent tents - 2 nights in Mkhuzi we stay in the park permanent tents, en suite. Swimming pool, telephone. WiFi not available. Distance / Time: 550kms, ± 7½ hours, excluding stops for sightseeing & breakfast. 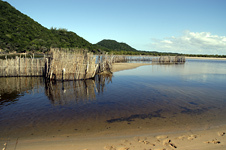 Kosi Bay Nature Reserve covers a region of fertile estuaries, mangroves, dune forest and tidal lakes. We explore this amazing eco-system on foot and also snorkel at the estuary mouth. A special feature of the Kosi Bay estuary is the traditional practice of subsistence tidal trap fishing. A local guide will lead us on a walk in the neighbouring village where we meet local Zulu people and are introduced to their culture and customs. Leatherback turtles and loggerhead turtles lay eggs on the beaches at night (November - January) and an excursion can be arranged to view this beautiful natural occurrence (own expense). Includes: Snorkelling at Kosi Bay River Mouth (mask & snorkel can be hired from the lodge at a nominal fee), Zulu village visit. Day 3, 4: Breakfast provided by the tour leaders with the help of the group. Day 3, 4: Lunch provided by the tour leaders with the help of the group. Day 3, 4: Dinner provided by the tour leaders with the help of the group. Day 5: Breakfast provided by the tour leaders with the help of the group. Day 5: Lunch provided by the tour leaders with the help of the group. Day 5: Dinner will be a set menu provided by the lodge. Overnight: Amangwane Lodge chalets – for 3 nights in Kosi Bay we stay in permanent tents. Each has twin beds and en suite bathroom. WiFi not available. Distance / Time: 180kms, ± 2½ hours, excluding stops for sightseeing. Optional Activities: Leatherback turtle excursion (only available November – January). 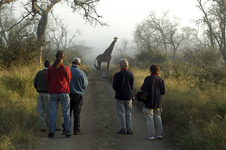 Includes: Entrance fees to Hlane Game Reserve, bushwalk local field ranger. Day 6: Breakfast provided by the tour leaders with the help of the group. Day 6: Lunch provided by the tour leaders with the help of the group. Day 6: Dinner provided by the tour leaders with the help of the group. Overnight: Hlane Game Reserve, chalets – for 1 night in Hlane we stay in the park chalets. Each chalet is en-suite. WiFi available. Distance / Time: 350kms, ± 6 hours, excluding border formalities, excluding stops for sightseeing. Includes: Day 7: Breakfast provide by the tour leaders with the help of the group. Day 7: Lunch provided by the tour leaders with the help of the group. Day 7: Dinner will be an own expense meal. Overnight: Catembe Gallery Hotel – 1 night in Maputo we stay in a guest house. Twin rooms with a shared bathroom between 2 bedrooms. Bar, restaurant, telephone. WiFi available. Distance / Time: 120kms, ± 1½ hours, excluding border formalities & stops for sightseeing. Includes: Day 8: Breakfast will be provided by the guest house. Day 8: Lunch provided by the tour leaders with the help of the group. Day 8: Dinner provided by the tour leaders with the help of the group. Day 9: Breakfast provided by the tour leaders with the help of the group. Day 9: Lunch provided by the tour leaders with the help of the group. Day 9: Dinner provided by the tour leaders with the help of the group. Day 10: Breakfast provided by the tour leaders with the help of the group. Day 10: Lunch provided by the tour leaders with the help of the group. Day 10: Dinner will be an own expense meal at a local restaurant. 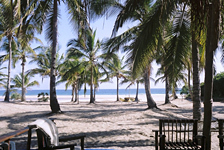 Overnight: Casitas, Palm Grove Resort – for 3 nights in Inhambane (Praia do Tofo / Barra) we stay in en-suite rooms. Bar, restaurant, telephone. WiFi not available. Distance / Time: 500kms, ± 7 hours, excluding stops for sightseeing and lunch. 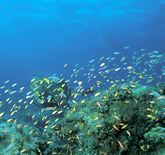 Optional Activities: Scuba diving, ocean safari & sailing and many more. Includes: Day 11: Breakfast provided by the tour leaders with the help of the group. Day 11: Lunch provided by the tour leaders with the help of the group. Day 11: Dinner will be an own expense meal at a local restaurant. Overnight: Laguna Camp, chalets – for 1 night in Bilene we stay in chalets. These are twin rooms with shared bathroom facilities. Bar, restaurant, telephone. WiFi available. Distance / Time: 355 kms, ± 5 hours, excluding stops for sightseeing and lunch. Optional Activities: Snorkelling, Sunset Cruise & Fishing (please note that these are subject to time availability). Includes: Entrance fees to Kruger National Park, morning and afternoon game drives. Day 12, 13: Breakfast provided by the tour leaders with the help of the group. Day 12, 13: Lunch provided by the tour leaders with the help of the group. Day 12, 13: Dinner provided by the tour leaders with the help of the group. Overnight: Kruger National Park chalets – for 2 nights in Kruger we stay in national parks board chalets with en-suite facilities. Swimming pool, restaurant, and telephone. WiFi not available. Distance / Time: 350kms, ± 5½ hours, excluding border formalities & lunch stop (this is a long day!) + 3 x 3 hour game drives. Optional Activities: Night game drives in National Park game viewing vehicles. After an early morning game drive we return to Johannesburg in the evening, sun-tanned, laid-back and ready to rejoin life. Tour ends at 6:00pm. Distance / Time: 450kms, ± 6½ hours, excluding stops for lunch. Note: There is a free drop off at Johannesburg airport on day 14 at 17:00pm, so you can book your flight out for the last day of tour. Note: The distance and travel times quoted above are an estimate only, and subject to local road conditions. Special Interest: The traditional fish traps of Kosi Bay mouth are cleared each day, by the local community. Only larger fish are caught as they cannot leave the estuary with the outgoing tide. Sustainable Tourism: We spend 3 nights in the Kosi Bay area. This KwaZulu Natal park is an example of how conservation and the needs of the local communities can work hand in hand. The local community is permitted to harvest fish within the reserve using environmentally sustainable, traditional reed fishing nets. KZN Wildlife are pioneers in the development of sustainable tourism. Due to occasional poor roads we use custom safari trucks with 12 seats for this tour. Potholes, rain damaged gravel roads, livestock and children on the roads can make travel slow, but at the same time you’ll pass through villages and witness the local lifestyle all the way. Game viewing in the national parks will be in the custom safari vehicle. There is no local payment required on this safari. An essential part of your safari is participation. From carrying your own bag to your room to packing the truck in the morning – it’s all part of your adventure. Your tour leaders will do the meal preparation when required but we do ask the clients to help (on rotation) with the washing up. There are some long travel days which means early morning starts so we all need to get involved to make the day run efficiently. Craft shopping in Mozambique and KwaZulu Natal is limited but you may find some small local vendors with carvings or batiks. Zululand is renowned for its grass weavings. • We pride ourselves on giving very good healthy meals to our clients and will provide three meals per day, except where shown in the itinerary, where we try out local restaurants. •	Anyone who is generally active and in good health should enjoy this trip. The accommodation used is simple but clean and this trip will appeal to anyone interested in getting an insight into the eastern coastline of Southern Africa. •	KwaZulu Natal and Moçambique can be hot and humid in the summer rainy months (December – March) so drink lots of water. 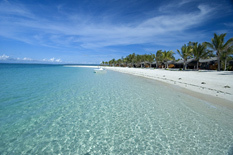 •	There is plenty of time to relax and unwind on the beaches, after all this is your holiday. •	You will need a valid passport and visas for entry into into Swaziland, Mozambique and re-entering South Africa. Please note that the Mozambique visas can be arranged in advance but can also be obtained at the border. Moambique entry border is Namaacha from Swaziland and exit border is Ressano Garcia into South Africa. •	Travellers cheques are not accepted anywhere in Mozambique on the tour route. We suggest you take Euro, US$ or South African Rand cash for this trip. • Is it safe? KwaZulu Natal and Mozambique are relatively safe and your guide knows the countries intimately and will endeavour to show you the best parts while looking after you. In the cities, such as Maputo, keep a careful eye on your belongings and don’t leave anything lying about - petty theft is not impossible. In the wild areas your guide will brief you on the necessary precautions, follow this advice and you will be fine. Be aware of your personal belongings and you will have a great trip! • Do I need malaria tablets? Yes, the trip passes through malaria areas and prophylactics are recommended. Please consult your doctor before arriving in Southern Africa.